(AKA Teddy) 1981, Starring Sammy Snyders, Sonja Smits, Jeannie Elias, Laura Hollingsworth, Andrea Swartz. Directed by Lew Lehman (Amulet Pictures). Of all the questions posed by one film character to another down through cinema history, few are as loaded and perplexing as the one directed by twelve year-old Jaime to his beloved babysitter, Sandy, as she scrubs his back in the bath one night: "Do you know why my mother washes me so much?" This is one of the queasier moments in The Pit, a unique concoction of Canadian horror movie and After-School Special gone terribly, terribly wrong. Jaime, the hero, seems to have emerged whole from one of those hallowed 4pm epics like The Boy Who Drank Too Much, but in this case he's more like The Boy Who Couldn't Make Friends Because His Possessed Teddy Bear Commands Him To Be A Pervert And A Creep. For most people, the discovery of a quartet of troll-like monsters living in a pit in the woods would complicate rather than simplify their lives but for Jaime, the bright-eyed creatures, whom he names " tra-la-logs," provide emotional balance and some much-needed companionship. The monster pit also serves as a depository for the legions of mean people in town, whose greatest pleasure seems to come from Jaime's constant torment. To get all these people in the pit where they belong, Jaime uses a combination of mild subterfuge and a very specific disability of perception, evidently suffered by the whole town, in which huge holes in the ground only become visible when it's too late. But, inevitably, Jaime runs out of people who are too blind, clumsy or stupid to blunder into his pit, and so he tosses a rope down to his homunculi friends and bids them good luck and bon appetit. The film's final act has the toothy hedgehog creatures embarking on a very mild rampage around the town, in which they carry off and eat skinny-dippers and the like. 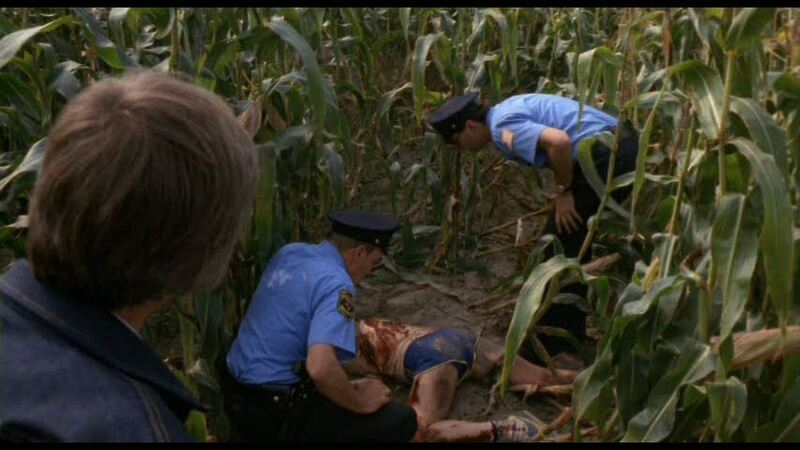 A dull-witted farmer tries to pin the blame on escaped "orange-erans," and the sheriff is far too dumb and provincial to do much of anything but eventually the townsfolk form a posse and blast the monsters to jelly with their shotguns. So as to avoid any publicity from reporters who might want to write about the wholesale slaughter of a dozen people by prehistoric trolls, the tra-la-logs are unceremoniously covered over with dirt and the whole matter forgotten. But Jaime comes to a sticky end in the film's short coda: sent to stay with his grandparents, he meets his distaff counterpart, an amoral little girl named Alicia who thinks nothing of pushing people into the entirely separate pit she has discovered in the woods nearby. We freeze on Jaime's terrified bowl-cut as he plummets to his doom. 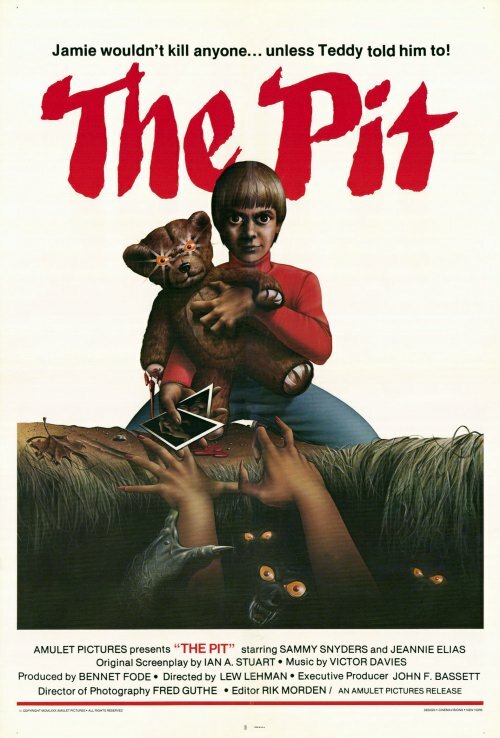 The Pit is as Canadian a movie as has ever been shot in Beaver Dam, Wisconsin. The film's screenwriter, Ian Stuart, wrote the film--originally called Teddy--as an earnest exploration of the inner life of an autistic child. The tra-la-logs and the talking bear were all products of Jaime's mind, and his perversions were mostly interior. But as is so often the case when noble intentions and B-movie values clash, the project mutated on its way from page to screen. No longer was Jaime demonstrably autistic (though the press notes and video jacket copy still deem him so) now, as personified by an actor called Sammy Snyders, Jaime is an intense moppet with leering eyes and a mercurial personality who invariably chooses the least socially acceptable ways of professing his love. Immediately upon meeting his new live-in babysitter, Sandy, he contrives to look up her skirt on her first morning there she wakes to find him leering at her exposed breast he sneaks in to the bathroom (which, curiously, has a clear glass door) while Sandy is showering and scrawls 'I love you' on the mirror. At the same time, all the horror elements in Stuart's script were externalized by director Lew Lehman. The tra-la-logs were upgraded to real creatures, and even the talking teddy, who gives Jaime all of his most perverse ideas, is shown to be genuinely possessed--or something--in a shot in which we see its head swivel around. Many of the issue-oriented aspects were maintained, however--much furrowed-brow talk of Jaime's misbehaviour and discussion of psychiatrists, treatments and institutionalization--and this, along with the dark hints of child abuse, help give the film its bewildering A.S.S. patina. Despite being mostly filmed in Wisconsin (for reasons unknown), the cast is made up almost entirely of Canadians. Sammy Snyders, the put-upon lead, had appeared as Tom Sawyer in episodes of a Huck Finn TV show and had guest-starred in both The Littlest Hobo and The King of Kensington. He's now reported to be a dance and movement instructor in Toronto. He and his career have been sporadically discussed since 1999 on a fan club webgroup made up of people who seem practically obsessed with both Snyders and his greatest role, Jaime. Sonja Smits (Videodrome) appears in a small role as a sympathetic teacher who befriends Sandy, and Sandy herself was played by the perky Jeannie Elias, who had appeared in Canuxploitation nuggets such as Paul Lynch's rassling drama Blood & Guts and Mario Azzopardi's Deadline. 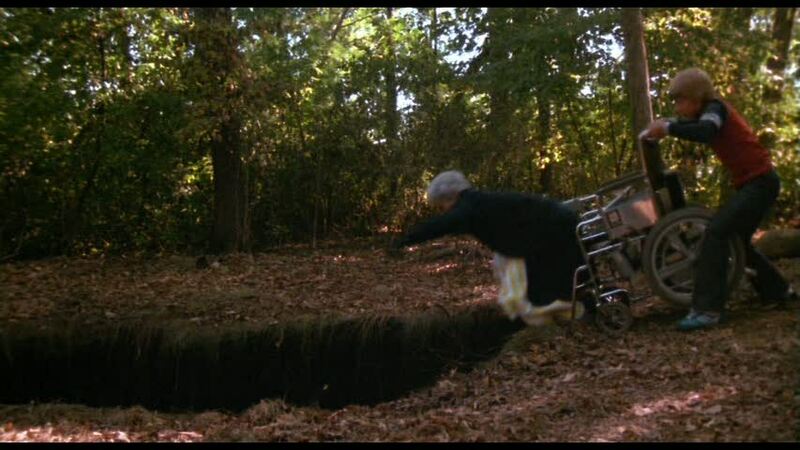 The Pit represents the sole directorial credit for Lehman, who had been the president of the Directors' Guild of Canada and was one of the screenwriters on John Huston's ill-advised tax-shelter thriller Phobia. As DGA president, he later oversaw an attempt to have director Robert Clouse replaced as the director of the killer-rat picture Deadly Eyes because Clouse wasn't Canadian. (The production was stalled for a day or two, but ultimately went ahead with Clouse at the megaphone anyway.) The choice of Beaver Dam, Wisconsin as a location for The Pit (even with a mostly Canadian crew) is even more confusing in the face of such protectionist demonstrations from its American-born director. 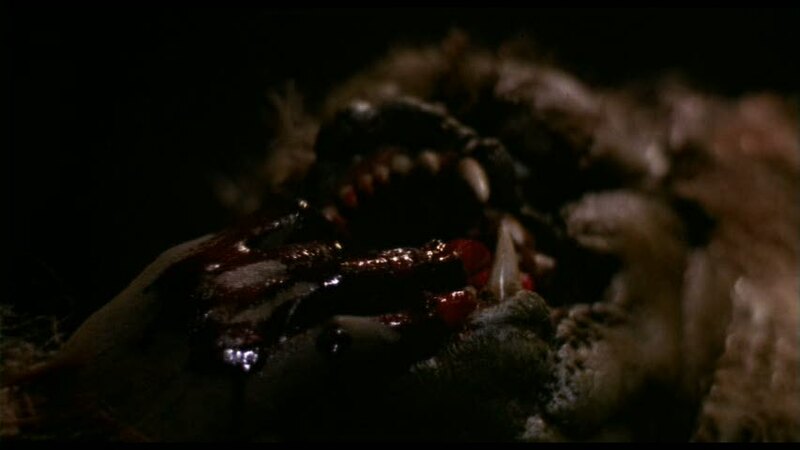 In any case, crucial bits of the movie were filmed in Toronto after all: the shots of the creatures in the pit were re-done with new costumes built in Los Angeles, after the original outfits were deemed to look too much like angry macramé wall hangings. The Pit is an unusual entry in an already unusual subset (namely, Canuxploitation) of an unusual genre. Though it would have been an even more entertaining experience had the tra-la-logs escaped their pit a half-hour earlier in the picture, digging through these layers of peculiarity is ultimately a rewarding and entertaining experience, and a good example of the sort of movie people mean when they say, "they sure don't make 'em like that any more!"